Ketchup or mayonnaise? It’s the age old question which has led many a good chip to go cold while a verdict is pondered. 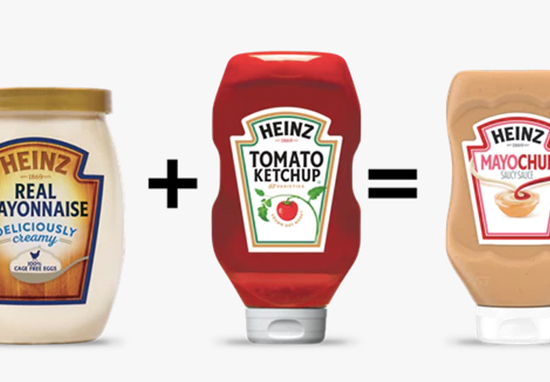 You could of course stir them both together to make your own Marie Rose sauce (aka fry sauce, aka fancy sauce) but how do you ensure the perfect balance between the two sauces, letting the notes of both condiments sing in perfect harmony? Fear no more. Heinz is now set to pour Mayochup all over the land of the free; combining their ever popular ketchup with mayonnaise in a creamy, tomatoey concoction. The response was surprisingly passionate on both sides of the debate, but Mayochup fans won out with 55 per cent of the final vote. After seeing the unprecedented passion surrounding this product, including the nearly one million votes on social media and 500,000 votes in favor of bringing it stateside, launching Mayochup in the US was a no-brainer. We’re excited to officially welcome Heinz Mayochup sauce to the Heinz family of products, including ketchup, mustard, BBQ sauce and our most recent addition, Heinz mayonnaise. This is the best idea….I’m so tired of having to mix my own! Thank you. I’d eat that. I know I mix ketchup and mustard, but that sounds delish! However, many saucy sorts have a distinct feeling of deja vu, and feel a bit shortchanged by Heinz’ description of a ‘US debut’. After all, mixing ketchup with mayonnaise has long been a mealtime tradition in American households, particularly within the Puerto Rican community where it’s referred to as ‘Mayoketchup’. First of all: this is fry sauce. We have had it in Idaho/Utah for longer than I’ve been alive…. so stop claiming it as your own and enough with the name “mayochup” . If you put it on shelves it better be called fry sauce!!!? Full disclosure, I’m still somewhat of a virgin when it comes to Marie Rose sauce as I’m kind of a fussy baby who doesn’t like to see things all mixed up and messy on my plate. However, I’ve been reliably informed, by various UNILAD colleagues, this is a pretty delicious condiment, ideal with a nice prawn cocktail. With the launch of Mayochup, perhaps it’s high time I threw caution to the wind and tried a dollop or two? Currently, Mayochup will only be available in the old US of A, but who knows what the future holds for this devil-may-care sauce? It’s up to you in the UK … 50,000 votes for Yes and we’ll put it on the shelves! There are six days left to vote, with 5,842 votes at the time of writing. Get voting or forever hold your disapointment if you want to bring a little Mayochup to this side of the pond!